Need something simple yet with a difference as a promotional gift? 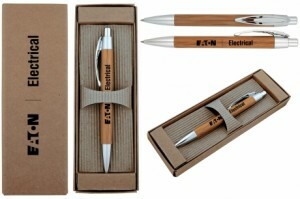 Take the standard pen for example and give it an innovative and eco-friendly twist. Why not get your brand or service noticed through one of the oldest tricks in the book –the trustworthy pen. The offering of this innovative pen made from recycled bamboo which comes in a recycled cardboard box is environmentally friendly in every way. Made from recycled material and disposable in an eco-friendly way make it truly an eco-friendly product. With this product you can really show to your customers that you care for the environment. This attitude is important to give you an edge over competitors. Modern day consumers demand ethical and responsible business practices from companies that provide them their services and products. This is evident to see in the current popularity of organic and fair trade products. People have a more positive attitude to recycling and re-usable products. Make the most of the current consumer climate by offering this versatile executive pen set as a gift, promotional product, on-pack promotion or employee present. Think green! Think Executive bamboo pen set!